Aston Martin said a drop-top version of the DBS Superleggera was coming, and here it is. 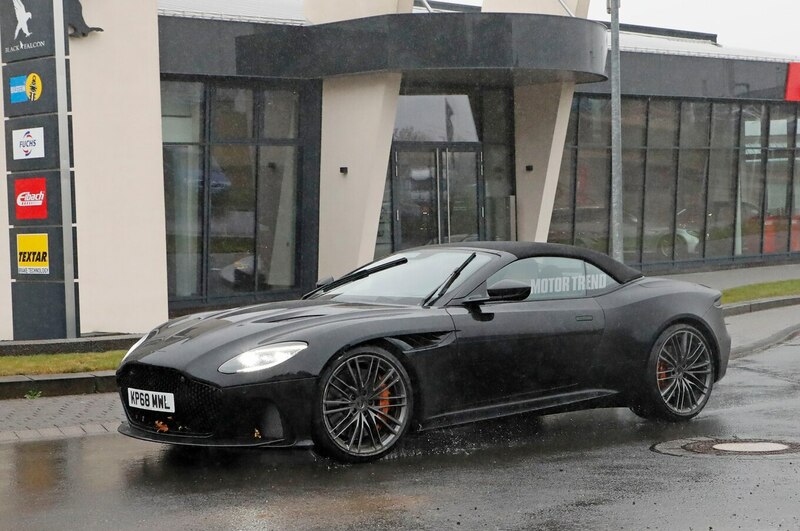 Our spy photographers caught this beauty testing in Germany on a rainy day. Unfortunately, this meant the model kept its top on the entire time. Aston Martin CEO Andy Palmer said making the DBS Superleggera Volante was a “no-brainer.” In a conversation with Autocar, he said Aston’s customer base has grown and demand has opened up for new vehicle variants. The drop-top should pack the same 5.2-liter twin-turbo V-12 engine as the DBS Superleggera coupe. This engine, paired to an eight-speed automatic transmission, makes 715 hp and 664 lb-ft of torque. Although we have yet to run a DBS Superleggera coupe through our testing regimen, Aston Martin claims it takes 3.4 seconds to hit 62 mph. Figure the convertible version will be about the same, if not a tenth or so slower. “Dynamically, the DBS rocks. What a wonderfully sorted front end,” we wrote in our First Drive of the DBS Superleggera coupe. “The steering is beautifully weighted, neutral, and imbued with great-for-a-modern-car feedback.” One of the few complaints we had was its price, which starts at just over $308,000. The convertible is likely to exceed this amount when it goes to market. Aston Martin also confirmed it will build a high-performance AMR version of the DBS Superleggera. Presumably, this model will receive a sport-tuned suspension and more power. Palmer said it could also enhance torque over the original model. The post Spied! Aston Martin DBS Superleggera Volante Revealed in Full appeared first on Motor Trend.